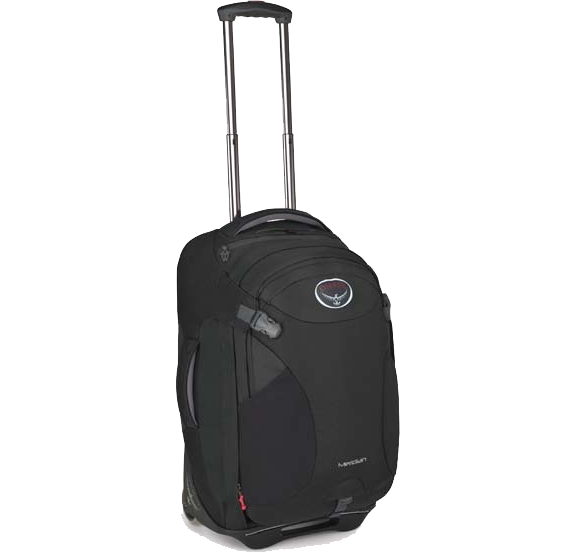 I am going cut to the chase on this one: the Meridian 22" Convertible Wheeled Pack from Osprey Packs can be used for just about every type of trip you can think of! Whether you are going international or domestic, business or pleasure, this will serve your purpose. I took this with me on a week-long trip to Sao Paulo Brazil , and a short stint to New Orleans, both for business. First, this main bag is deceptively roomy. When I first unzipped it I struggled to see how it could fit more than one set of clothes; the retractable roller handle supports seemed intrusive, and some of the external pouches fed into the main storage area. As I started filling it I could not believe how much this thing can hold! I packed 3 days’ worth of work clothes, workout clothes, dry toiletries, and my running shoes (size 14) with ease. The zippered pouch on the top of the bag held my liquid toiletries which makes it easy to pull out for airport security. Small zipper pockets inside the bag are convenient for keeping smaller items, such as chargers, out of the way. The detachable backpack is just as surprising in its storage capacity. At first, the slim profile appears as though you could get nothing more than a couple of notebooks and magazines in it. I put my laptop, iPad, keyboard and mouse, travel documents, snacks, and I was not even close to capacity. There is a large divider inside that I used to separate my laptop from everything else. This thing has pockets everywhere, both inside and out, which makes for excellent organization. Inside there are open pockets for IDs, business cards, etc., as well as open holes to slide in pens or pencils. A large, slim inside zippered pocket is a great place for travel docs, a wallet, maps and the like. On the outside, a pocket on each side provides spots for readily-accessible items; I put some medicine bottles in one and my iPad and iPhone chargers in the other with room to spare (the latter point being a common theme). The large pouch on top can hold sunglasses and smaller valuables for quick storage. As is common now, there is also a spot to feed through your headphones wire so you can keep you music player tucked away. What initially seemed like a little bag provided ample storage while still being a legal US carry-on, with the backpack is removed. Not too many cons to speak of. The zippers use short pull cords tied to eyelets, but upon opening two of these were already broken. Because they do not have the traditional zipper pulls these are difficult to open without them. Easily repaired on your own, but a little inconvenient. The only other drawback is that you have to unclip the backpack to access most of the major storage. Of course, that would be necessary for the roller bag, but being able to access the backpack would be nice. Fortunately, there are 4 clip points so you only need to unclip the top one or two to get in. Again, inconvenient but not a big deal. Overall: As a runway/road warrior, I can say that this is the best piece of luggage I have ever used. There seems to be no end to the storage capacity and little places to tuck things away. 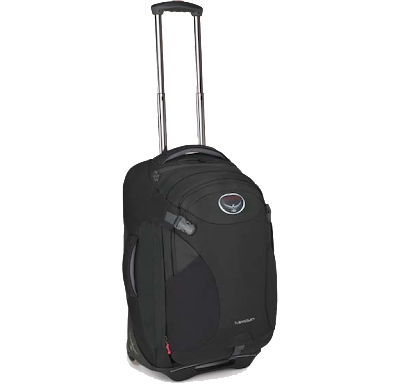 The backpack is comfortable, and the ability to strap it to the roller bag is excellent. For business travel this bag is great. 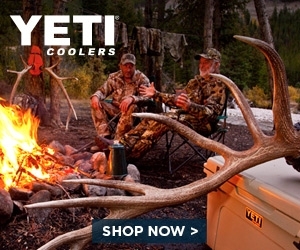 For a camping trip or leisure it would be even better. I’ll take two!